Zoë Svendsen created World Factory with designer and artist Simon Daw and a host of creative collaborators from different artistic and technical backgrounds. Here Zoë reflects on the process, and Birkbeck College’s Alex Colás (International Relations), Wendy Hein (Marketing), Kate Maclean (Social Geography), Joel McKim (Media and Cultural Studies) and Fintan Walsh (Theatre and Performance Studies) critically respond to the work’s themes. World Factory begins with a catwalk ‘show’ containing verbal shots fired from the rhetorical arsenal of contemporary global capitalism: quotes from speeches by Reagan, Thatcher and Deng Xiaoping outline the neoliberal agenda developed in the 1970s and 1980s. We wanted to demonstrate the historical contingency of the form of capitalism at stake in the performance and to dispute the ideology of its naturalness that today masquerades as common sense. The show has been advertised as a ‘game’, but the opening makes a clear statement that ‘this is theatre’: the plane of imagining is theatrical and metaphorical. Yet we discovered through our research – which included having a shirt manufactured in a Chinese factory – that we needed a form other than the documentary or the dramatic to address the multiply interlinked stories that bring together world of consumer capitalism. Dramatic structure tends to throw into relief personal relations. In much modern drama, the privileging of interiority, with dramatic expression as a revelation of an interior, continuous selfhood, invites judgement on the part of the audience as to the reasons behind an action, reasons that are tacitly figured in terms of personal agency and choice. When Joe Keller in Arthur Miller’s All My Sons outlines the social conditions surrounding his lies about a decision that ultimately caused several deaths, it makes impact as an individual’s mastery of excuse-making, rather than as a political statement. The wider situation becomes fodder for the exploration of an individual psychology. In World Factory this structure is reversed. 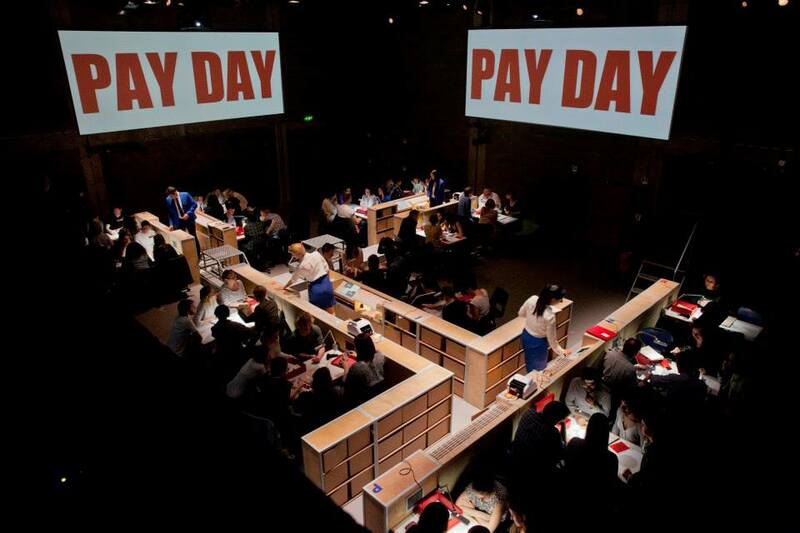 Rather than judging others psychologically for their politically and socially conditioned decision-making, World Factory seeks to reveal the limiting circumstances of contemporary consumer capitalism by inviting audiences into the midst of the decision-making process of those at the sharp end. 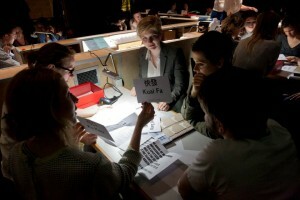 In groups of six sitting around 16 tables (16 ‘factories’), each ‘factory’ serviced/commanded by a dealer (performer), by means of a digital barcoding system, World Factory invites its audience members to imagine themselves having just taken over a clothing factory in China. The mode of participation invited is analogous to the way that a game such as Monopoly avoids the question of ‘who’ the players really are. 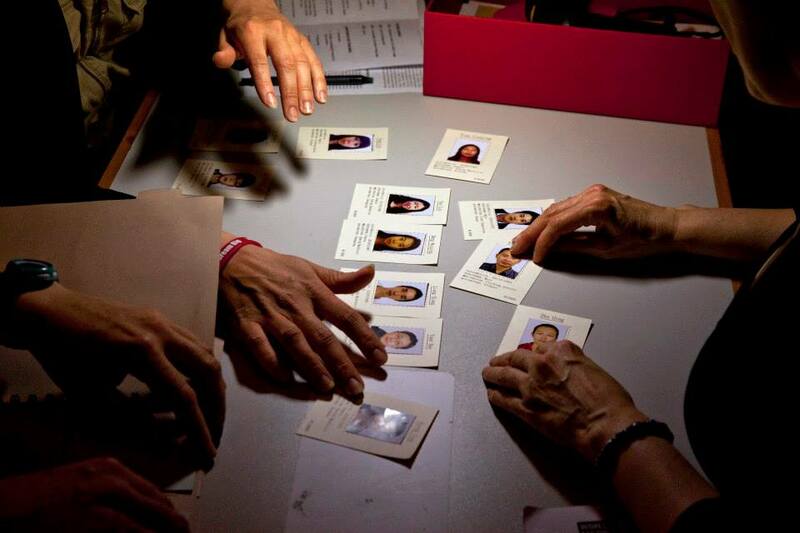 Each ‘factory’ also has a stash of money – ‘capital’ – and twenty workers (represented by short ID cards). The ‘game’ starts when the dealers hand each factory a card posing a problem: ‘You have to cut the wage bill’, and on the back of the card, a binary set of options, each of which promise to take the decision-makers on ‘different pathways through the World Factory’ (as the ‘game’ instructions advise). Scenarios unfold over the course of between 18 and 24 cards, depending on speed of play; it is thus a dramaturgical arc that enabled us to render tangible the knotty question of how to be ethical, in real terms, when faced with actually having to survive within a global capitalist structure. Finally the show returns to the audience the aggregate of their decisions in the form of data, displayed on vast graphs, under the aegis of a finale entitled ‘THE RECKONING’ and played out as a merging of game show, award ceremony, and political news broadcasting, performed with ambivalence on the part of the performer-dealers. 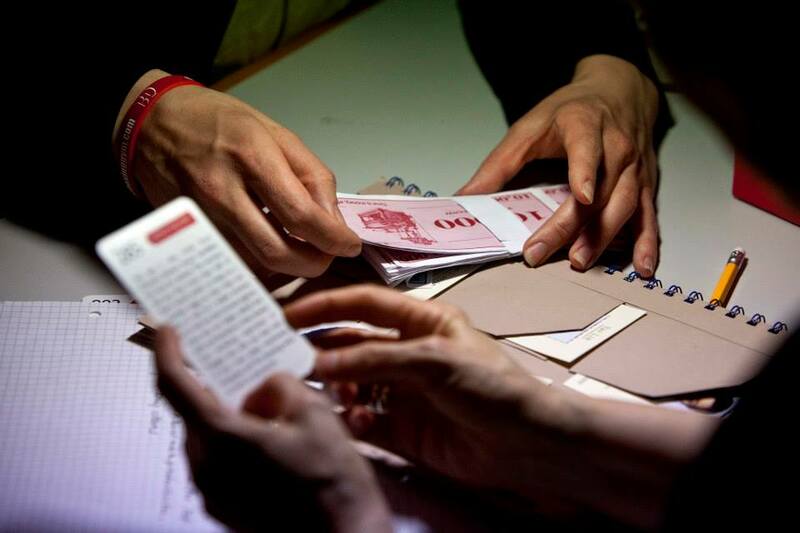 Post-show, the audience each receive a printed till-roll receipt, detailing every decision their factory made, with links to the real-world situations the stories were based on, on our ‘digital quilt’. 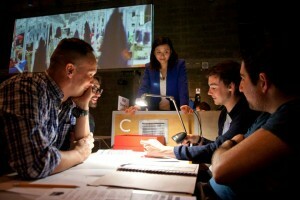 This immersive, multi-sensory game structure, that shifts the position of the audience from sitting in judgment to participating in the midst of the dilemma, allowed us to link together the multifarious and pressing problems of our time, figured through the lens of a factory system invented in the UK and now prevalent globally. These problems include: precarity; labour rights (including child labour), pollution and wider environmental impacts, outsourcing, living conditions, working conditions, education/emancipation, supply chain (non)transparency and concomitant responsibilities, migration and immigation, resource use, waste management, and so on. The emancipatory potential of the game lies in the direct provocation a simple binary offers in the face of such complexity, both to conversation with those sitting around the table, and to the imagining of alternative possibilities, outside the system. How germane World Factory would be to this imagining we only realized as we were in technical rehearsal on 8 May 2015: the day of the British parliamentary elections. There was a sickening feeling in the stomach when our 2.2 m high by 5.5 m wide billboard screens screamed ‘DO NOT FAIL’, behind Lucy Ellinson – as Margaret Thatcher in 1980 – saying: ‘The task in which the Government are engaged – to change the national attitude of mind – is the most challenging to face any British Administration since the war.’ For World Factory – both the subject-matter of the show, and some of the ways in which audiences responded – suggests that Thatcher did indeed ‘not fail’ to change the British ‘attitude of mind’. Rather, she achieved nothing less than the dismantling the post-war consensus formed from a cohesive understanding of shared value. Yet far from ‘preaching to the converted’ as that clichéd attack on political theatre would have it, the conversational impetus within participatory projects like World Factory uncovers a very diverse range of opinion and attitude, held both consciously and unconsciously. 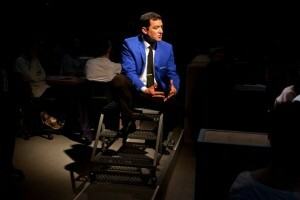 It demonstrated that despite rhetorics of imperative, there are no easy answers to the questions the performance posed. Casino capitalism is a catchphrase often invoked to describe the high-stake gambles that seem to drive contemporary financial markets. Anyone following the fate of Greece, and by extension the European Union over the past months, will have found it hard to avoid the vocabulary of play and games: risk, rules, betting, cheating, trust, winners and losers are the protagonists of the current crisis. Yet finance is only one of several forms in which capital appears in the world, another crucial one being what Marx called ‘the hidden abode of production’ where labour-power is combined with raw materials and technology to create commodities. World Factory immerses us in this domain of value-production, forcing participants to make fast decisions about various business ‘options’ (raising wages, firing staff, taking bribes, recognising union reps) on playing cards dealt out by croupier-like actors. This immediately draws attention to an axiomatic feature of modern societies which sociologist Anthony Giddens called ‘structuration’: we are both agents and products of wider social structures, including markets. 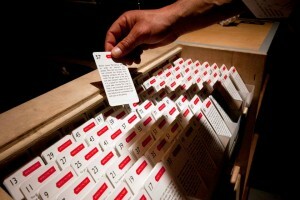 In selecting one of the options on the World Factory card, however, it quickly becomes apparent that players are making decisions, not choices: competition and the profit-motive make certain hypothetical options unviable or suicidal if the aim of the game is the survival and growth of a company. This recognition of the skewed power relations embedded in the very logic of value-production and accumulation need not preclude the possibility of democratic change in the form of wealth redistribution, environmental sustainability or workers’ rights and welfare. But it does drive home how such democratic gains are the result of collective mobilisation and socio-political antagonism – and which might ultimately only be guaranteed with a radical transformation in the ‘rules of the game’. The theme of mobility is also fleetingly captured in the accounts and biographies of garment workers who move from field to factory, from one type of factory job to the next by way of improving their life-chances and those of their family and children. The aspiration to social mobility through a stable, secure and properly-remunerated employment underscores the dialectic between movement and stability, circulation and accumulation which characterises not just capitalism a global system, but also – in different ways – the lives of actually-existing individual investors, managers, workers and employees who reproduce this very system every day. And herein lies perhaps the greatest paradox, even contradiction, in the contemporary celebrations of capitalist globalisation, namely the dependence of the never-ending circulation of money and commodities on what geographer David Harvey terms ‘spatial fixes’: a social and physical infrastructure and built environment that can both absorb the periodic over-accumulation of capital, and facilitate –through transport and communication links, regimes that can enforce property rights, education systems that can deliver a disciplined and skilled workforce – the limitless reproduction of capitalist value. The title World Factory already invokes the global scale of capitalism, and the constant movement of its small cast across the production-space reinforces the seemingly footloose flows of wealth across the world. 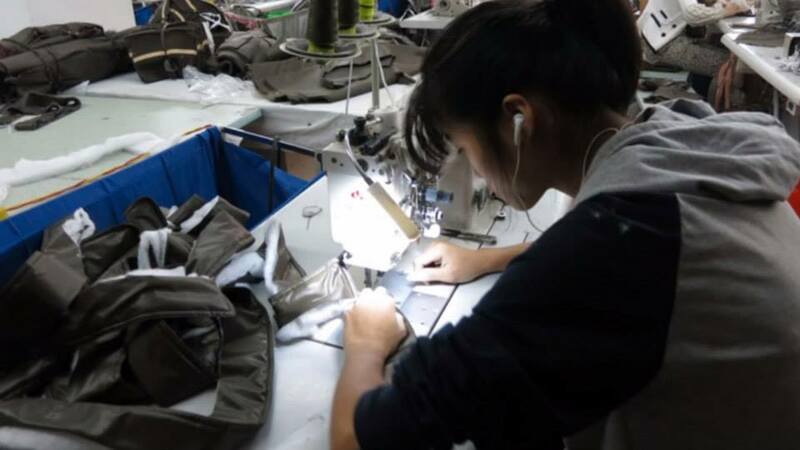 Yet on reflection, the most important actors in this story – the garment workers producing the wealth and the factory managers deciding how to use it – are static, sat at our tables stitching together next season’s skirts or pondering whether to hire illegal Vietnamese workers or not. We live in an age where celebrity, popular culture and fashion converge, and where feminism forms part of prêt a porter, at least for one season. Fashion cycles have become shorter and faster, and despite signs of new consumer trends that ‘less is more’, demands for a fashion quick fix seem recession-proof. We are searching for new heights in productivity, sales, and capital gains. When I say ‘we’, I refer to consumers and industries that produce enough disposable income, enough time and enough persuasion to ride the insatiable waves of global fashion. In World Factory, meanwhile, focus seems rightly placed on addressing the complexities of textile production, historical and contemporary fast paced markets, linked to individual narratives of workers, factory owners, and designers, all contextualised within broader economic and political structures. As such, it allows us to experience the wide-ranging consequences of globalising markets through the lens of seemingly powerless and also influential players. In thinking about World Factory as an academic piece of work, I relate it to my own academic discipline: marketing and consumer research. If I were to write a paper about all these dynamics, structures, practices and narratives for a mainstream journal, my guess is it would be quickly rejected. It would be critiqued for its attempt to connect too many dots, and mainly, for being too political. This makes me reflect on why the mainstream of my discipline is not addressing these issues at its core. Why is it not changing to keep up with global challenges? Who or what is it trying to preserve or protect? There is significant research on sustainability and fashion, but it does not often reach the mainstream. Mainstream marketing researchers appear stuck in conversations of how to improve efficiency and effectiveness for corporations, never mind the global cost, along with how to continue justifying marketing as a discipline. The main goal of the academy becomes knowledge production in the form of publications in high-profile outlets, and it seems assumed that corporations should benefit from this knowledge, without considering broader intended or unintended consequences. To use dominant, challenged but unchanged marketing rhetoric, practically and strategically, what matters most is how we can ‘capture’, ‘target’ or ‘penetrate’ a bigger and better market. Any political or ethical questions are unashamedly neglected and at best pre-empted, but not confronted. This kind of research is clearly not working towards alternative worlds, but rather towards what appear to be unavoidable developments of globalising markets and capital. The knowledge production machine is one cog in this system. The beneficiaries of this process, then, are the individual researchers and their related institutions. Research thus becomes an industry with self-momentum that is as selfish and neoliberal as industry and politics, and arguably the consumers that marketing initiatives address. Yet in contemporary marketing research, we would like to understand consumers as agentic and empowered. 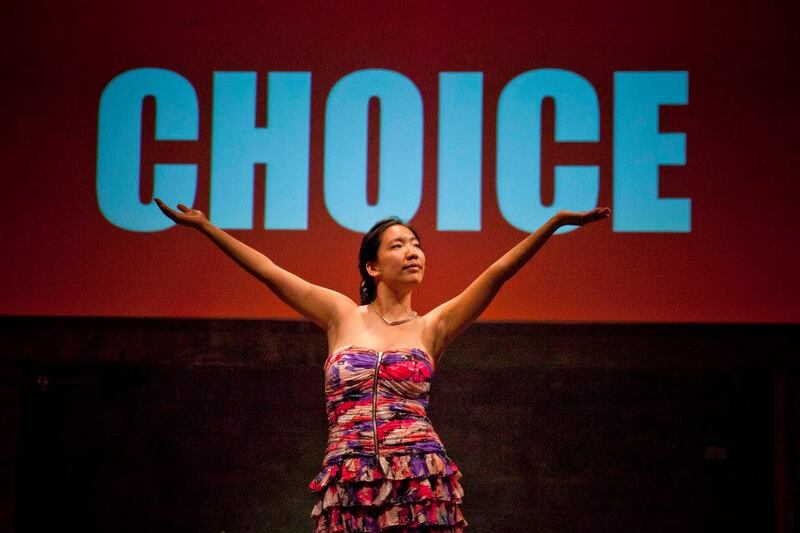 It is argued that informed consumers make better and more ethical choices. This has led to calls for transparency, and the production of commendable rankings of clothing companies that are sustainable or ethical. Games are often proposed as vehicles for changing consumer mindsets. Similarly, consumer communities are now directly involved in shaping brands: think Star Wars, Warhammer, Porsche (interestingly these high profile examples are rather male-dominated). As much as this is our desired ideal of the consumer, and therefore places responsibility on to consumers to change, another reality is that consumers often feel depressed, particularly due to political austerity, and choice as empowering has been critiqued as an ill-conceived concept. But if consumers do not have a choice, we rightly learn in World Factory that choices of textile producers are equally limited and that their main aim is survival. Everyone seems at the mercy of ‘the market’, but nobody seems to know who is in charge. Producers are told to follow consumer demands while consumers are persuaded to buy into the market. We have a chicken/egg situation. Markets all the while, at least in my mind, get away unscathed, and market(ing) researchers are clearly occupied elsewhere. If World Factory has the potential of opening discussions of increasing global inequalities and unsustainable systems, it is more than a piece of theatre or game. However, the realisation that we need to change markets on a global scale has to reach disciplines such as marketing, alongside other systems that are not doing their share in challenging dynamics that are at play. Views of globalisation from the developed world – whether from the international investor, high street consumer or critical academic – are situated in bodies of knowledge that continue to enjoy colonial privileges. Following Spivak, post-colonial theorists have emphasised that, in order to begin to understand the experience of people who have been historically constructed as the ‘other’ to the dominant West, those in positions of privilege in the global order need to embark on a journey of ‘unlearning one’s learning’2 and questioning ingrained assumptions that serve to perpetuate that order. The process of ‘unlearning’ is never entirely achievable and riddled with contradictions,3 but learning ‘other’ languages, understanding the challenges and impossibilities of translation, and immersion in ethnographic exploration, can all start to erode the hard-wiring of powerful ideas of what counts as good, fair, or normal, and help parochialise one’s own conceptual schema.4 Of course, having the opportunity to do the above is itself a privilege. What’s more, any fall into epistemic relativism or abstinence that the ‘unlearning’ process might invite, is an inadequate position given the weight of evidence that global forces are destroying livelihoods and environments around the world, particularly in the global South. It is in the midst of these tensions that World Factory’s use of a game to engage with the dilemmas of globalisation makes an interesting contribution. Games, as pedagogues and psychologists have long known, are an effective way of getting people to adopt a different position – or ‘role’ – and understand the world from a different point of view. In the 1970s, geographer Graham Chapman introduced the Green Revolution Game, to help students of rural development understand the dilemmas and inequities that were introduced to agricultural communities with the advent of Green Revolution (GR) technologies – high yielding crop varieties that require fertiliser and irrigation.5 Whilst GR crops are credited with saving the world from hunger, their implementation also created a divide among agricultural producers between those that could afford these expensive techniques, and those that could not. In the classroom, the GR Game involves students being divided into teams, all of whom start with different amounts of land, different family sizes and different numbers of labourers. There is one rule – that you cannot let anyone in your family die. As the seasons progress, and the poorer teams realise that they are increasingly dependent on their richer neighbours who have been able to take advantage of GR technology, the game ceases to be about agricultural development, and starts to be about relationships within the classroom. Students from poorer teams feel exploited as they have to beg their neighbours to take in one of their kin, or to rent out land so that they will be able to feed their families. A ‘real life’ informal economy develops as students trade favours, promises and goods, in order to get the support they need to survive in the game. The fury and frustration that develops offers students a momentary, and, it must be emphasised, still very removed, idea of what may be being lost in translation when experiences from a rural development context are referred to with the familiar lexicon of ‘inequality’, ‘community’ and ‘subsistence’ in their recommended texts. In the same way, the game the audience is invited to play in World Factory might potentially shake the certainty with which many people approach frequently polemic debates around globalisation. The choices the teams have are binary and therefore simplistic, but nevertheless, based as they are on long-term ethnographic research on particular factories in China, the stories on the cards manage to evoke a picture that is complex enough to ensure that dichotomous debates around growth versus equality, or profit versus ethics, cannot be maintained. Every experience of this game will be different, and, as with the Green Revolution game, I would venture that discussions around the table between audience members, who may have only just met, are as elucidating as the performances on stage. 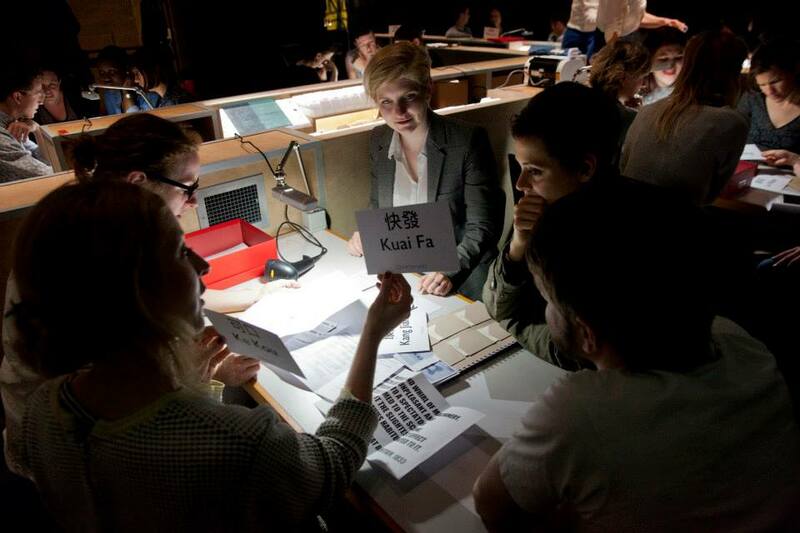 Despite all coming to the play with worked-out positions on the globalisation debate, players at my table swiftly recognised that we did not have the discursive resources to resolve the dilemmas facing our factory, or even to understand them fully. Although we could have all been accurately referred to as ‘Western consumers’ of the global garment trade, it was evident that our own global positions were more complex, as we were also activists, researchers or entrepreneurs. As our discussions continued in reaction to the insurmountable dilemmas presented on the cards, it became clear that although our lives were ‘global’, as we had also confronted the insecurities and opportunities of a global economy, our ‘cosmopolitan’ experiences still only afforded us a partial, parochial view of the complex phenomenon that is globalisation. World Factory’s innovative use of technology to engage spectators/participants in a simulation of the economic and ethical decisions facing Chinese textile factory owners brings to mind two prominent discussions within digital studies: the phenomenon of ‘gamification’ and the politics and aesthetics of data. Gamification, the incorporation of game elements (like levels or challenges) within non-game contexts, is an ambivalent term within videogame culture. It can refer to a cynical perversion of gaming techniques in the service of corporate marketing, or sincere attempts to find new ways of engaging people in political causes or processes, the Games for Change organization being one prominent example. The progressive variant of gamification attracts descriptors like ‘critical play’, ‘serious games’ or ‘persuasive games’ – the latter both the title of a book by Ian Bogost and the name of the videogame company he co-founded. Persuasive Games have designed such titles as Killer Flu, commissioned by the UK Clinical Virology Network, and Windfall, an educational strategy game about renewable energy. This year’s Games for Change Festival featured 11 bit studios’ This War of Mine, which places the player in the position of a group of civilians trying to survive a besieged city, and Filament Games’ That’s Your Right, an interactive card game about the American Constitution aimed at high school students. But some of the notions at the heart of even these well-meaning forms of serious games – that we can play our way to a better world or that we can be trained to be more responsible citizens – are open to question. All forms of gamification rest on certain assumptions regarding behavioural modification that have particular political implications. The game play in World Factory functions slightly differently than these examples of persuasive video games, subverting or confounding some of the political assumptions of most serious digital games. The experience of World Factory, with its seemingly impossible moral choices and ever-shifting rules of play, hardly feels like straightforward political or ethical training. The production is less an education in proper behaviour, than a confrontation with the extreme difficulties of coming to terms with the political uncertainties and contingencies of global citizenship. The complexities of the political situation presented by World Factory are driven home by the unusual presentation of statistical data at the end of the production. 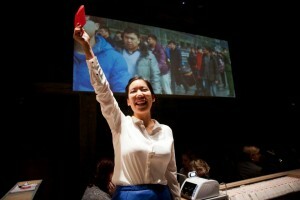 The play concludes by the participants being made aware that their choices throughout the game have been digitally aggregated and this information is offered back to them as a series of stats and rankings: number of garments produced, number of employees killed or injured, most productive factory, etc. Data journalism and data art are by now commonplace, but for me this was a first encounter with something we might call data theatre. METIS’s movement towards the incorporation of data is an interesting development for theatre and represents, in my possibly naïve view, an acute shift in the traditional aesthetic strategy and scale of the discipline. While data presents a wide view, an aggregate, a statistical norm or established pattern, on stage we are accustomed to zeroing in on the specificity of one life, relationship or family against the backdrop of a larger historical moment or set of events. The shift towards a data-oriented approach in theatre would be consistent with the widespread notion that the issues of our time are too complicated and dispersed to be captured in a single snapshot or scenario; that they must be confronted at the scale of populations and mass phenomena. Yet an embrace of data will certainly have political ramifications for theatre, some of which may already be visible in the World Factory production. Does an increase in statistical scope necessarily involve a dampening of emotional or affective impact? Along with a better understanding of the complexity of global textile industries, does the combined experience of data accumulation and game-based problem solving involved in World Factory risk producing a strange kind of sympathy with the processes of globalization? In other words, are we, as participants, left with a sense of statistical inevitability or political resignation when faced with the overwhelming multiplicity of economic forces impacting the global garment industry? To its credit, World Factory resists the temptation to simplify the political situation it seeks to represent and it therefore invites rather than shies away from these difficult questions. Rather than offering a training exercise in global citizenship, the play provokes an important and timely discussion regarding the very possibility of presenting the complexity of global politics through performance. World Factory finds theatre in the factory workplace, by putting the factory workplace into a theatre building. The Young Vic auditorium is transformed into a windowless bunker of small Chinese textile businesses, whose audience-turned-owners must make a series of important decisions during the course of the two-hour production. Approximately six people make up each collective, most participants meeting each other for the first time. Cards outlining pressing dilemmas are handed to each group by one of the show’s four uniformed assistants, who lead the event like spritely game show hosts. All the quandaries involve some kind of tension between workers’ rights, the environment and the need to make profit. How will we deal with our broken heating system, taking into account its impact on workers’ productivity, and the cost of repair? Should workers be bussed home for holidays to boost morale, or kept onsite to work? Discussions are intercut with images, recorded footage, and statistics projected across large screens mounted on the walls. These provide varied perspectives on life in factories, from 19th century Manchester to 21st century China. Without a central scene or story to follow, what kind of theatre is this? It is immersive in the sense that the space is organised from the outset as if we are business owners – there is no opportunity to do anything or be anyone else. It is participatory, too, insofar as we must work together for the show to take place. But, like radical traditions of twentieth century documentary theatre, it also informative in that we learn quite a bit about the global textile industry via the facts and figures shared. We may even learn from each other. 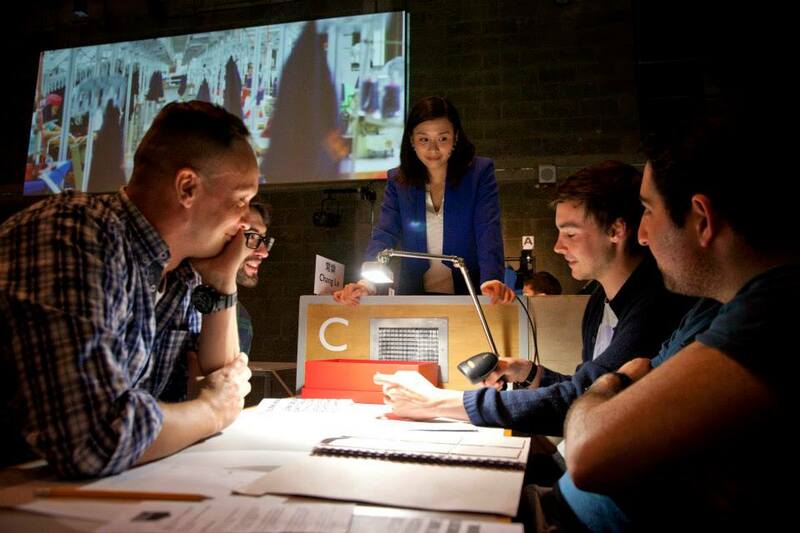 By putting imaginary factories into a theatre, and positioning theatrical practice as a way to think about what happens in factory work, there’s a strong suggestion that they too have something to learn from one another, in particular as ecosystems of labour and sociality. How do labour and sociality interact in this production? Team members sit around a table – all strangers, at mine. We identify ourselves by first names. No obvious roles are administered, so we self-organise. Things start off gently and politely, with everyone granting the opportunity to others to read a card aloud, or to share opinions. We vote with raised arms. These niceties give way with the realisation that bold interactions and daring decisions are much more rewarding. These choices also tend to be the ones with the capacity to generate the greatest amount of capital, to the detriment of workers’ rights and the environment. Not only do we want to take risks and make profit, but soon we also want to beat other teams, whose successes and failures resound around us in triumphant ‘whoops’ and deflated ‘aws’. What strikes me most is how members of the left-leaning group in which I find myself all eventually respond to the small adrenaline hit of taking a risk, even when it is to the detriment of the people and places they might otherwise protect. (But to play this double standard is part of the pleasure of role-play, after all.) This thrill drives our enthusiasm, even when we know that there will be negative consequences. In World Factory, taking a risk is more enjoyable than taking an ethical stand. The production seems to want us to balance our desire for chasing profit with caring for the workers and the environment. Given that we never have to deal with face-to-face resistance from either – such as in the form of reckoning with real or fictive affected individuals at our meetings – to summon this concern is tough. 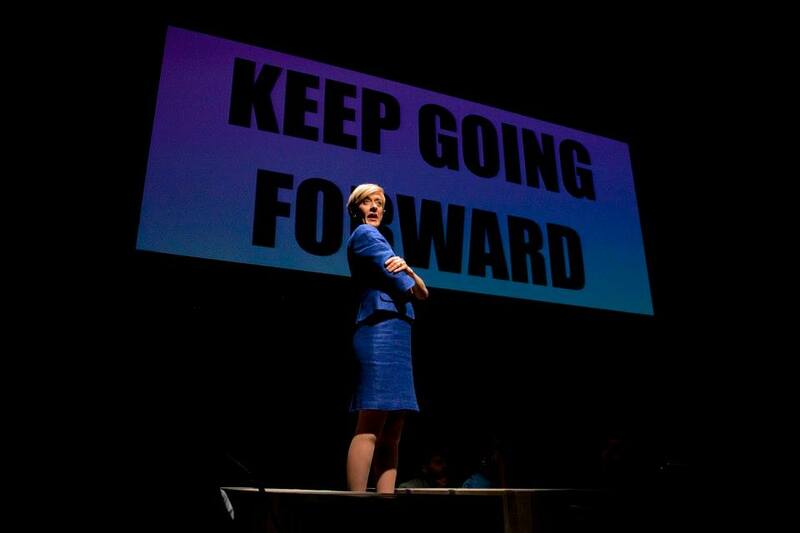 At some point, even the most socially-conscious team member caves to pursuing profit, because pursuing profit also involves taking part in, and creating, more exciting theatre. To adopt a socially or environmentally sensitive position would require re-educating oneself not to be excited by the risky game-play on offer, or to have some form of direct contact with the fall-out of one’s choices. We encounter some of these at the end of the show, when offered statistics concerning the negative impact of our decisions. Too late to alter our game-playing, perhaps, but not too late for a lesson. But if I were to do it all again, I would probably make the same risk-oriented, profit-hungry choices: for to give up on these would also mean to give up on theatre. I wonder what it would be like to play the game as a worker. Would that simply be too tedious, too limiting? Could the worker’s experience ever have life as a similar theatrical game, without the power to make so many choices? What would a game of workers and owners, pitted against one another, look and feel like? If capitalism is a sort of game – as the production seems to suggest it is – and part of the reason games are fun is because they involve an element of risk, what kinds of games might we play where risk and reward are more evenly distributed? ‘World Factory: the politics of conversation’ was staged as part of Birkbeck Arts Week 2015. 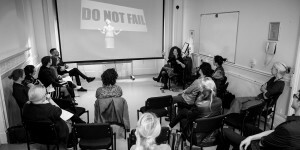 Thanks to Louise Owen (Lecturer in Theatre and Performance and Co-Director of Birkbeck Centre for Contemporary Theatre) for curating the event and its documentation for CTR Interventions. Zoë Svendsen is a director, dramaturg and researcher. 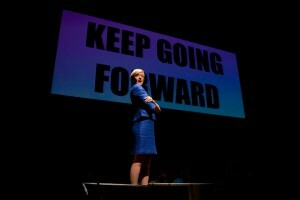 Director of METIS (www.metisarts.co.uk), Zoë creates research-led interdisciplinary performance projects exploring contemporary political subjects, including: World Factory (New Wolsey Theatre/ Young Vic) and 3rd Ring Out (TippingPoint Commission Award). As dramaturg Zoë collaborates on contemporary productions of classic texts, including Miss Julie (Aarhus Theatre), Arden of Faversham (Royal Shakespeare Company), Edward II (National Theatre), Measure for Measure and The Changeling (both Young Vic). Zoë lectures in Drama and Performance at the University of Cambridge, and is currently affiliated artist at the Max Planck Institute for the History of Science, Berlin, and an honorary research fellow at Birkbeck’s Centre for Contemporary Theatre. Joel McKim’s research focuses on spaces of political communication in the urban environment and the intersection of media technologies and architectural design. His work draws together such fields as architectural and urban studies, digital media theory, memory studies, philosophy of aesthetics and communication theory. Kate Maclean is a feminist geographer who has published on the used clothes trade, informal markets, microfinance, urban development, risk and finance. She has conducted research in Bolivia, Colombia, Mexico, Mali and Burkina Faso, and her publications include articles in Development and Change; Antipode; Gender, Place and Culture; and the Journal of Gender Studies. Wendy Hein is a Lecturer in Marketing at Birkbeck, University of London. Her research focuses on gender – particularly men, masculinities and feminism – in marketing and consumer research and related methodologies. Fintan Walsh is Senior Lecturer in Theatre and Performance at Birkbeck, University of London and Co-Director of the Centre for Contemporary Theatre. He is author of the forthcoming book Queer Performance and Contemporary Ireland: Dissent and Disorientation (Palgrave Macmillan, 2015). Alex Colás teaches international relations in the Politics Department, Birkbeck, University of London. He is author of Empire (Polity Press, 2007) and is currently researching the relationship between capitalism and the sea.